A respiratory tract infection is any infection of the sinus, throat, airways or lungs. It is usually caused by a virus. Upper respiratory tract Infections (URTI) - It affects sinus, nose and throat. 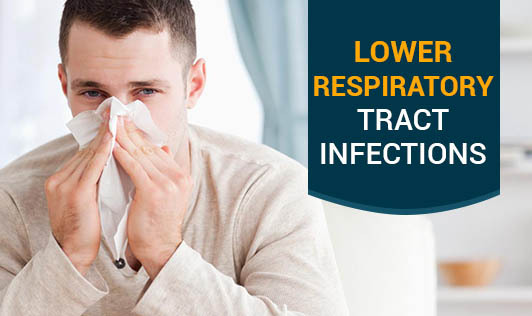 Lower respiratory tract Infection (LRTI) - If affects the airways and lungs. How does one contract a respiratory infection? Infections can spread either through direct or indirect contact. For example, if you have an infection such as cold, tiny droplets of fluid containing the cold virus enters air whenever you sneeze, cough or speak. If these are breathed in by someone else, they may also become infected. The main symptom of LRTI is similar to a common flu which is accompanied by cough. If cough is more severe, you may bring up phlegm and mucus. Other possible symptoms could be a tight feeling in your chest, breathlessness and wheezing. Care for your symptoms at home. Generally most of these symptoms can be treated at home by taking over-the-counter medicines, drinking plenty of fluids and adequate rest. You can also try these home remedies. Take steam inhalation: It will aid in removal of mucus and also helps in relieving the pain of congestion and headache. Mix one tea spoon of fresh turmeric paste in half-a-cup of warm water. You can have this mixture twice a day. Turmeric has antiseptic properties and will aid in fighting infection. Do deep breathing exercises. Yoga and Pranayama will improve the overall functioning of the respiratory tract and alleviates the symptoms of breathlessness. If you have the habit of smoking, it is best to stop it. Smoking delays the recovery of LRTI. As these symptoms are common even for chronic infections like tuberculosis and pneumonia, you should not ignore them if it is persisting for more than a week. In such cases, it is very important to visit your General Physician for proper diagnosis and treatment as it might not be a common cold and cough!